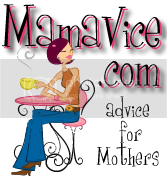 With school back in full-swing, it can be hard for us moms to make sure our kids are getting the nutrition they need, not to mention making sure that what they eat/drink is healthy for them. 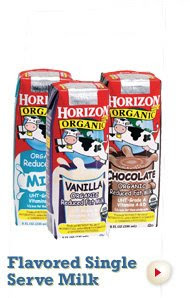 There is one product, however, that meets all of those needs, and is quick and convenient - Horizon Organic Milk. Horizon Organic provides essential nutrients without the dangers of antibiotics, pesticides, or growth hormones so parents can rest easy when serving it to their kids. My kids absolutely LOVE Horizon Organic's Flavored Single Serve Milk, which come fortified with Vitamins A and D, and come in fun flavors and travel-ready containers. Vanilla is their favorite and they especially beg me for it whenever I swing by Starbucks (where they can just grab one out of the refrigerator case there). Click here to sign up for free coupons so your family can enjoy the taste, nutrition and convenience that comes with Horizon Organic Milk!